"Mormons" is a nickname for members of The Church of Jesus Christ of Latter-day Saints. There are a few fundamentalist sects that call themselves "Mormons," but they are not affiliated with the real Church, which is often nicknamed the Mormon Church (see FLDS). Members of the Church prefer to be called "Latter-day Saints" when nicknames are used. When members of The Church of Jesus Christ of Latter-day Saints are called by their nickname, "Mormons," it is because of their open body of scripture, which includes the Book of Mormon. The Book of Mormon is a history of some Israelites who escaped from Jerusalem in about 600 BC, just before the Babylonian Captivity. They were led by God to a promised land in the Americas. They established a civilization led by kings, judges, and prophets who taught them about Jesus Christ. They kept the Law of Moses looking forward to Christ, and Christ visited them after His resurrection, establishing His church among them. By about AD 400 the people had become so wicked that they destroyed themselves in a series of wars. Some of the American Indians are of their lineage. Mormon was a great prophet who lived near the end of this period. He abridged the record to the form in which it was given to Joseph Smith. group that grows up around a powerful personality. Members are in the thrall of the leader and general follow bizarre practices. Joseph Smith was the founder of the LDS Church, and the first prophet of the "Last dispensation of time." Mormons honor him, but they don't worship him. The Latter-day Saint religion is centered on Christ. Mormon beliefs sometimes seem bizarre to those who've received a false representation of Mormon doctrine. Mormonism is not a new religion, and not an American religion, but is the restoration of Christ's original Church. All of the beliefs found in Latter-day Saint doctrine were central in the early Christian Church. Latter-day Saints do not dress in pioneer garb or live in secretive groups. Latter-day Saints do not practice polygamy. 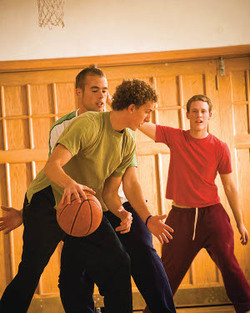 Latter-day Saints do not refrain from sports, dancing, singing or enjoying themselves. Many famous entertainers are Mormons. Temple rituals are not secret. Guided tours for the public are conducted through each new temple. 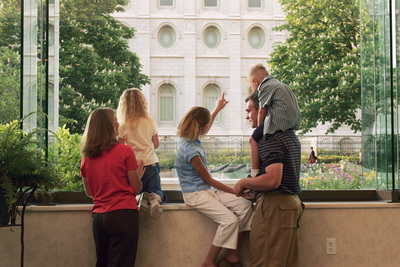 The covenants made in the temple are sacred and are not to be discussed outside in the world. Thus, even Latter-day Saints who have been to the temple do not discuss their covenants with other Mormons outside of the temple. Latter-day Saints are not polytheists. However, they do not believe in the trinity—that is, that God is a spirit who became embodied as the Christ and then went back to being a spirit containing three entities. Instead, Latter-day Saints believe that the Godhead is composed of three separate beings, God the Father, Jesus Christ (His Only Begotten Son), and the Holy Ghost. Latter-day Saints believe that when Jesus was resurrected, He stayed resurrected, and is a resurrected being of flesh and bone, albeit glorious and powerful beyond description. This is the same belief as the very early Christian Church. Some people say that Latter-day Saints are polytheists, because they believe that men, in a process of eternal progression, can become like God, indeed that this is the Father's central goal for all of us, to make us like Him. This belief was also solid in the early Christian church. This does not mean that a plurality of Gods governs this world, except that the Godhead is made up of three beings. Latter-day Saints have little information on the details of life eternal, but more than any other church. Latter-day Saints do not believe that nonmembers are disqualified for heaven. The gospel is perfectly fair. All of us are judged on what we know. A person who has never heard of Christ or the commandments of God cannot sin. Virtually every person who has ever lived will inherit a kingdom of glory. Only sons of perdition (who have a sure witness of Christ and then deny Him) qualify for "hell." Latter-day Saints do not believe that we are saved by our works. However, the Lord judges us by our thoughts, intentions, and works. After all we can do, we cannot save ourselves. It is the grace of Christ that saves us. Latter-day Saints do believe in the words of James, that faith without works is dead. Members of the Church of Jesus Christ do not believe that the heavens are closed. Nor have they ever been. A constant flow of information from God has enlightened men and women of every age. All prophets, including those of the Old Testament, even Adam, knew the Plan of Salvation and taught of Jesus Christ. Modern prophets have the same connection with heaven. Latter-day Saints do not believe that miracles have ceased. They are common-place where the power of God is manifest through the power of Priesthood authority and through faith of believers. Latter-day Saints do not believe in an impersonal God. God hears all prayers and answers those who seek Him in humility. All are privy to personal revelation when they seek it. They are clean-living, service-oriented, education-oriented, Bible-believing Christians. Because of the priesthood authority conferred through prophets from God, all the charismatic gifts are present in the Church. Latter-day Saints are family-oriented, because they believe that God has ordained that families should be eternal units. The family is so central to God's plan for mankind, that the Lord has told them through prophets to bravely defend the sanctity of the home and "traditional" marriage. In 2010 a book was published called American Grace: How Religion Divides and Unites Us. The book was the result of extensive study by scholars Robert D. Putnam and David E. Campbell and yields valuable insight into the nature and social effects of American religion. Latter-day Saints are among the most devout religious groups in the country. Latter-day Saints are among those most likely to keep their childhood faith as adults. Latter-day Saints are among the most charitable of Americans with their means and time, both in religious and non-religious causes. Latter-day Saints are relatively friendly to other religious groups. This page was last edited on 15 October 2018, at 12:32.